Basile's Invitation: Accept an invitation to join the Fighters Guild. Hilan's Invitation: Seek out the Fighters Guild. Bounty: Black Daggers: Kill bandits for the Cyrodiil Fighters Guild. Bounty: Gray Vipers: Kill bandits for the Cyrodiil Fighters Guild. Bounty: Shadowed Path: Kill necromancers for the Cyrodiil Fighters Guild. These quests are offered by Cardea Gallus located within the Fighters Guild buildings of Elden Root, Mournhold and Wayrest. These quests will send you to destroy three Dark Anchors in a random zone. These quests can be shared with other members of your group, so it is possible to do up to 15 of these quests in a day. These quests will give Fighters Guild reputation, as well as small box of rewards. These quests are one way of obtaining the Draugr motif. Dark Anchors in Alik'r Desert: Help destroy Dark Anchors in Alik'r Desert. Dark Anchors in Auridon: Help destroy Dark Anchors in Auridon. Dark Anchors in Bangkorai: Help destroy Dark Anchors in Bangkorai. Dark Anchors in Deshaan: Help destroy Dark Anchors in Deshaan. Dark Anchors in Eastmarch: Help destroy Dark Anchors in Eastmarch. Dark Anchors in Glenumbra: Help destroy Dark Anchors in Glenumbra. Dark Anchors in Grahtwood: Help destroy Dark Anchors in Grahtwood. Dark Anchors in Greenshade: Help destroy Dark Anchors in Greenshade. Dark Anchors in Malabal Tor: Help destroy Dark Anchors in Malabal Tor. Dark Anchors in Reaper's March: Help destroy Dark Anchors in Reaper's March. Dark Anchors in Rivenspire: Help destroy Dark Anchors in Rivenspire. Dark Anchors in Shadowfen: Help destroy Dark Anchors in Shadowfen. Dark Anchors in Stonefalls: Help destroy Dark Anchors in Stonefalls. Dark Anchors in Stormhaven: Help destroy Dark Anchors in Stormhaven. Dark Anchors in the Rift: Help destroy Dark Anchors in the Rift. Skills with this icon may need to be updated following changes in Update 20. Arm yourself with Meridia's sacred sword and dispense her retribution, dealing [7689 / 7773 / 7857 / 7942] Physical Damage to enemies in front of you and an additional 9221 Physical Damage over 5 seconds. Flawless Dawnbreaker While slotted, your Weapon Damage is increased. Arm yourself with Meridia's sacred sword and dispense her retribution, dealing [7945 / 8033 / 8120 / 8208] Physical Damage to enemies in front of you and an additional 9221 Physical Damage over 5 seconds. While slotted, your Weapon Damage is increased by [2 / 3 / 4 / 5]%. Dawnbreaker of Smiting Increases the damage and stuns enemies hit. 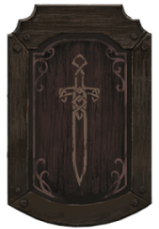 Arm yourself with Meridia's sacred sword and dispense her retribution, dealing [9186 / 9287 / 9388 / 9490] Physical Damage to enemies in front of you, an additional 10605 Physical Damage over 5 seconds, and stunning them for [1.8 / 2 / 2.3 / 2.5] seconds. Fire a Dawnguard Vampire Hunter's crossbow bolt to strike an enemy, dealing [4919 / 4973 / 5027 / 5081] Physical Damage and reducing their Movement Speed by 40% for 4 seconds. Silver Shards Fires up to five additional bolts at other enemies near the initial target for less damage. Fire a Dawnguard Vampire Hunter's crossbow bolt to strike an enemy, dealing [5083 / 5139 / 5195 / 5251] Physical Damage and reducing their Movement Speed by 40% for 4 seconds. Fires up to five additional bolts at other enemies near the initial target for [50 / 49 / 48 / 47]% less damage. Silver Leash Decrease the range. Pulls the enemy to you. Fire a Dawnguard's crossbow hook to pull an enemy to you, dealing [5083 / 5139 / 5195 / 5251] Physical Damage, and reducing their Movement Speed by 40% for 4 seconds. Brand the earth at your location with a rune of protection for [17 / 18 / 19 / 20] seconds. You and your allies in the area gain Minor Protection and Minor Endurance, reducing your damage taken by 8% and increasing your Stamina Recovery by 10%. Turn Undead Increases the duration and fears Undead, Daedra, and Werewolves upon activation. Brand the earth at your location with a rune of protection for 24 seconds. You and your allies in the area gain Minor Protection and Minor Endurance, reducing your damage taken by 8% and increasing your Stamina Recovery by 10%. Upon activation, Daedra, Undead and Werewolves in the area are feared for [4 / 4.3 / 4.7 / 5] seconds. Ring of Preservation The rune also reduces the cost of Roll Dodge. Cost: [7987 / 7897 / 7807 / 7717] Stamina. Cost: [5671 / 5581 / 5491 / 5401] Stamina. Invoke your expertise in anatomy and enemy behavior to detect stealthed and invisible enemies around you for 5 seconds. Exposed enemies cannot return to stealth or invisibility for 3 seconds. While active the Stamina costs of your Fighters Guild abilities are reduced by [25 / 26 / 27 / 28]%. While slotted you gain Major Savagery, increasing your Weapon Critical rating by 2191. Camouflaged Hunter While slotted, dealing Critical Damage from Sneak grants Minor Berserk. Invoke your expertise in anatomy and enemy behavior to detect stealthed and invisible enemies around you for 5 seconds. Exposed enemies cannot return to stealth or invisibility for 3 seconds. While slotted you gain Major Savagery, increasing your Weapon Critical rating by 2191. You also gain Minor Berserk for [5 / 6 / 7 / 8] seconds after you deal Critical Damage from Sneak, increasing your damage done by 8%. Set a sharpened blade trap at your location, which takes 1.5 seconds to arm and lasts for 1 minute. When triggered, the trap deals 3073 Physical Damage, an additional [7845 / 7930 / 8016 / 8100] Physical Damage over 6 seconds, immobilizes the enemy for 6 seconds, and grants you Minor Force, increasing your Critical Damage by 10%. Rearming Trap After being triggered the trap resets and can be triggered one more time, but each trap deals less damage. Set a sharpened blade trap at your location, which takes 1.5 seconds to arm and lasts for 1 minute. When triggered, the trap deals 2151 Physical Damage, an additional [5537 / 5596 / 5656 / 5718] Physical Damage over 6 seconds, immobilizes the enemy for 6 seconds, and grants you Minor Force, increasing your Critical Damage by 10%. After being triggered the trap resets and can be triggered one more time. Lightweight Beast Trap The trap can be thrown up to 28 meters away. Range: 28 meters, Target: Ground. Launch a sharpened blade trap at a target location, which takes 1.5 seconds to arm and lasts for 1 minute. When triggered, the trap deals 3073 Physical Damage, an additional [8095 / 8183 / 8272 / 8360] Physical Damage over 6 seconds, immobilizes the enemy for 6 seconds, and grants you Minor Force, increasing your Critical Damage by 10%. Intimidating Presence 1 Allows you to Intimidate NPCs in conversation. Reduces the Stamina cost of your Fighters Guild abilities by 15%. Slayer 3 Increases your Weapon Damage by 1% for each Fighters Guild ability slotted. 7 Increases your Weapon Damage by 3% for each Fighters Guild ability slotted. Banish the Wicked 5 You generate 3 Ultimate when you kill an Undead, Daedra or Werewolf. 9 You generate 6 Ultimate when you kill an Undead, Daedra or Werewolf. 10 You generate 9 Ultimate when you kill an Undead, Daedra or Werewolf. Skilled Tracker 7 Your Fighters Guild abilities deal an additional 20% damage to Undead, Daedra and Werewolves. Bounty Hunter 9 Allows you to accept bounty quests from the Fighters Guild in Cyrodiil. All guilds use reputation for leveling purposes. Fighters Guild Reputation is earned by killing undead and Daedra, as well as by completing Dark Anchor Dolmens. You receive 1 for one kill, 5 for killing undead and Daedra bosses, 20 for destroying a Dark Anchor, 10 for completing a Dark Anchor daily quest, and 25 for each[verification needed — see talk page] Dark Anchor contract achievement. Fighters Guild Sorcerer, found in Dragonstar Arena. Fighters Guild Survivor, a generic member found in Spindleclutch I. No Ground Given 5 Complete your first Dark Anchor contract for Cardea Gallus. Return to Sender 10 Complete 10 Dark Anchor contracts for Cardea Gallus. Stay Out Of Tamriel 15 Complete 30 Dark Anchor contracts for Cardea Gallus. For historical information on the Fighters Guild, see the lore article. This page was last modified on 30 October 2018, at 16:44.